December 5, 2014 – NASA marked a major milestone Friday on its journey to Mars as the Orion spacecraft completed its first voyage to space, traveling farther than any spacecraft designed for astronauts has been in more than 40 years. The uncrewed flight test, called Exploration Flight Test-1, was designed to mimic the extreme re-entry forces and harsh environment that Orion will need to withstand when carrying astronauts on deep-space missions beyond the moon, to asteroids, and eventually Mars. While NASA’s first test flight of the Orion module signifies a huge step for the nation in our return to human spaceflight, its journey really began in Colorado. Colorado-based Lockheed Martin Space Systems leads the Orion industry team as the prime contractor building the Orion spacecraft. Another Colorado company, United Launch Alliance (ULA), launched the Orion spacecraft on a Delta IV Heavy rocket, the world’s largest and most powerful launch vehicle flying today. Ball Aerospace & Technologies Corp. provided the phased array antennas and flight test cameras. After a successful launch from Cape Canaveral, Florida at 5:05 MST this morning, Orion orbited the Earth twice, reaching speeds of 20,000 miles per hour and traveling through intense radiation in the Van Allen belt. Orion traveled to an altitude of approximately 3,600 miles above the Earth’s surface, more than 15 times farther than the International Space Station’s orbital position, before enduring a fiery, 4000 degree Fahrenheit re-entry into Earth’s atmosphere. The spacecraft was slowed by specially designed parachutes and gently splashed down into the Pacific Ocean off the coast of San Diego at 9:29 MST this afternoon, completing the first test flight of the deep space exploration capsule. A team of NASA, U.S. Navy and Lockheed Martin personnel aboard the USS Anchorage recovered Orion and will return it to the U.S. Naval Base San Diego in the coming days. 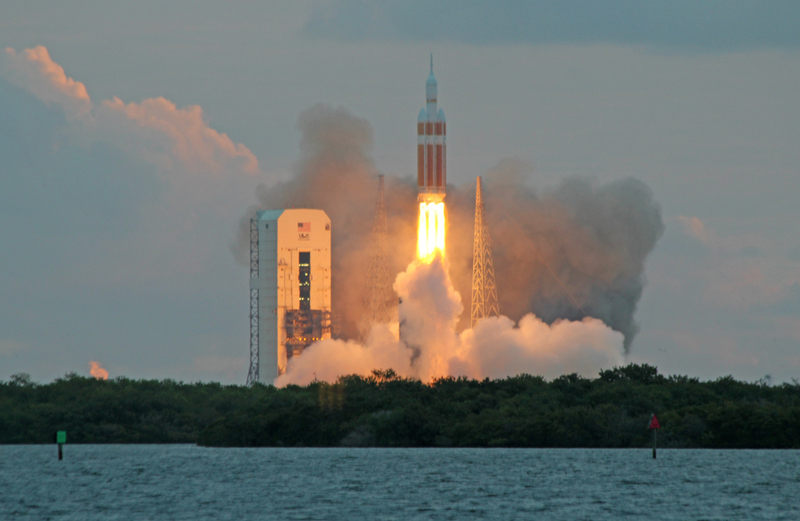 Orion will then be delivered to NASA’s Kennedy Space Center in Florida, where it will be processed. Throughout the flight, more than 1200 sensors recorded data from the spacecraft, which will be used to evaluate its performance and improve its design for future crewed missions. EFT-1 tested Orion’s heat shield, avionics, parachutes, computers and key spacecraft separation events, exercising many of the systems critical to the safety of astronauts who will travel in Orion. Initial data show the flight test met all requirements, but further analysis will be done in the coming months. NASA envisions multiple Orion capsules, and Lockheed Martin has already started building the next one. For future missions, Orion will launch on NASA’s Space Launch System (SLS) heavy-lift rocket, currently being developed at the agency’s Marshall Space Flight Center in Huntsville, Alabama. A 70 metric-ton (77 ton) SLS will send Orion to a distant retrograde orbit around the moon on Exploration Mission-1 in the first test of the fully integrated Orion and SLS system. Aerospace is one of Colorado’s highest paying industry sectors, with aerospace workers making an average annual salary of $127,000. Leading space projects such as Orion, the MAVEN mission to Mars, and the New Horizons mission to Pluto, have contributed close to 170,000 space-related jobs in the state, which is also home to more than 400 space-related companies. “The Orion spacecraft is a prime example of the breadth of Colorado’s aerospace industry,” said Tory Bruno, president and CEO of United Launch Alliance. “We are honored to be a part of such a dynamic industry and we are honored to serve the role our company and employees have played in such a historic launch for our nation. Colorado had an impressive 17 percent growth in aerospace employment during the past decade, and Colorado now ranks first in the nation for the number of private aerospace workers per capita. Colorado also has the nation’s second most highly educated workforce, a high concentration of major space military centers, and boasts research universities that are leaders in space innovation and producing the next generation of aerospace workers. Heat Shield: During re-entry, Orion’s heat shield withstood temperatures twice as hot as molten lava. Protection from the extreme heat of re-entry is critical for keeping astronauts safe on future deep space missions. Separation Events: A launch abort system, a service module, protective panels, and a forward bay cover successfully jettisoned from the spacecraft at predetermined times during the flight. Guidance and Navigation: Deep space missions require advanced avionics that guide the spacecraft using an array of sensors and thrusters. EFT-1 demonstrated Orion’s ability to guide itself autonomously through launch, orbit and re-entry. Radiation Protection: Twice during today’s flight, Orion traveled through the Van Allen belt, a layer of intense radiation located above Earth’s atmosphere. That will help engineers measure the effect of deep space radiation on both astronauts and on-board electronics. Crew Module Environmental Control: Sensors installed inside the crew module collected data on the acoustics, vibrations, forces, and temperatures future astronauts will experience during deep space missions. Parachutes and Recovery Operations: Orion’s 11 parachutes deployed in stages, slowing the spacecraft from a 20,000 mph re-entry to 20 miles per hour at splashdown, at which point the U.S. Navy and NASA Ground Systems led an at-sea recovery from the USS Anchorage.